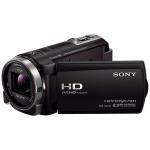 Sony HDR-CX430V Expert Reviews - Read Reviews and Buy Smarter Online. Verdict: I've had this for several years. I don't use it often, but when I've used it, there have been no issues. I've made home movies which look great after editing with Windows MovieMaker. Verdict: I bought this camera to replace my Sony HDR-HC1. The camera includes some amazing features. What I don't like about the camera- 1. Is there is no eye level viewfinder. I knew that when I bought it, but I wish it was an option. In order to get around that I purchased a LCD viewfinder for a DSLR.